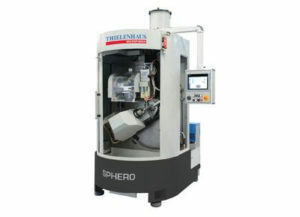 Sphero is the latest Thielenhaus Microfinish’s Microfinish machine to machine with great precision at little expense. The machining of workpieces with spherical forms pushes even the most modern hard turning and standard grinding machines to their tech-nical limits, as great demands are also usually being placed on dimensional accuracy and surface finish. For this demanding field of application, Thielen-haus Microfinish has developed a flexible and compact machining solution – Sphero – based on a platform proven in medical technology, which it unveiled at GrindTec 2016. This high-precision tool machine is equipped with a tool spindle unit that can swivel up to 90 degrees, allowing the optimal machining position to be chosen for every process. The clamped workpiece rotates at up to 4,500 revolutions per minute. This, in combination with the Microfinish tools’ corresponding form, enables the absolutely reliable machining of the entire outer surfaces of spheres and the inner surfaces of cups. The associated tool unit is arranged vertically and is easily accessible for quick retooling. Due to the integrated tool changer with capacity for up to ten tools, even complex machining processes can be carried out in only one clamping process. If necessary, a polishing process can be integrated follow-ing the Microfinish machining process. Workpieces with diameters of up to 75 mm can be machined on the Sphero. However, very small tools can also be used, and even thin-walled components can be machined. Furthermore, the machine’s construction is highly space-saving and is characterised by a modern, compact, cylindrical and ergonomic design. The Sphero is used for example in the automotive industry in the machining of the joint heads of wheel suspension and steering components that provide a high level of freedom and movement for the associated assembly units. In the chemicals industry, valves that aggressive or very hot media travel through require metallically sealing valve balls and seating rings machined with a high degree of dimensional and surface accuracy. Another instance is the axial pis-ton pump found in all fields of hydraulics: At the end of the pump there is a spherical sliding surface of only 10 mm diameter; however, the dimensions of this component must be accurate to 1 µm or less in order to guarantee safe operation at great strain – such as in aviation. With this new machining concept, surface topography, spherical roundness, spherical diameter and sealing surfaces can be machined. Furthermore, de-fined contact rations that fulfil tribological requirements are possible. In just a few installation steps lasting around ten minutes, the operator can convert the machine from outer machining to inner machining, i.e. from a sphere to a sealing ring. Finally, the Sphero can make the process even more cost-efficient by substituting the grinding process; this means that the workpiece enters the machine immediately after hardening and leaves it as a finished component. Operator influence is reduced to a minimum and errors due to repeated handling and clamping are ruled out, since the workpiece remains in the clamp until it is completely finished. This drastically increases process reproducibility. Since this machining solution allows the implementation of several tool quali-ties, the process can, for example, be broken down into roughening and smoothing. The tool change takes place in eight seconds with the added ben-efit that the workpiece stays in the clamp. Since the process happens on a self-correcting basis, truing cycles are done away with. This means that better end results can be achieved with short cycle times. The machine monitors the stipulated parameters itself on an on-going basis and makes any necessary adjustments. Therefore, checking the workpieces via random sample is sensi-ble, since the variation in tolerance is so small that they are not measurable in production using conventional measuring means, the differences being de-tectable only in a measurement room.